this was my first large scale free motion machine quilt project since I got my new Bernina last year. I learned a few things along the way, but over all I love the finished product and it just fueled my desire to continue and quilt some more.....so we'll see whats up next, I am thinking something with the scraps I already have in the stash since the beautiful backing fabric from this quilt broke the fabric allowance for a bit, but well worth it! 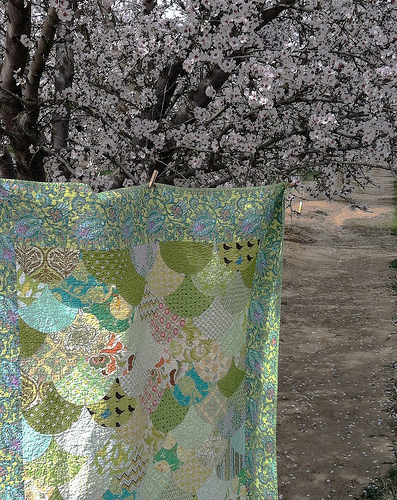 Since the almond trees are so pretty the quilt wanted its photo shoot outside so here it is.